HIMSS and AVIA collaborated to produce the 2013 Healthcare Provider Innovation Survey, which was conducted by email from Aug. 20 to Sept. 30, 2013, with select U.S. hospitals, academic medical centers, children’s and ambulatory care centers to understand the current state of innovation within provider organizations. By analyzing the data collected from the 92 participants, HIMSS and AVIA determined the top barriers to innovation. The data is not necessarily meant to be representative of the market, but rather, facilitate dialogue about what the market is doing to determine the top barriers to innovation and other findings as reported in the results. Cost reduction is the focal point of innovation initiatives. Almost 65 percent of respondents ranked this as their top innovation priority. Dedicated funding for innovation exists, but amounts remain modest and sources of funding are diverse. According to survey results, 67 percent of providers reported their annual innovation budgets total under $2 million. Providers are making progress implementing innovative solutions specifically in areas of high importance. These include: population health management, patient follow-up, predictive analytics, clinical decision support and care coordination. 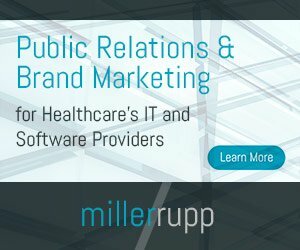 Significant risks of inefficiency and redundancy exist; 65 percent of respondents shared that communication among internal staff is the dominant source for information regarding healthcare innovation. As the slide above indicates, chief innovation officers are not yet mainstream roles within hospitals and health systems. 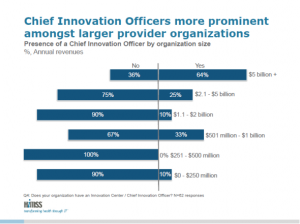 However, 64 percent of provider organizations with annual revenues of more than $5 billion reported having a Chief Innovation Officer. “As shown by the survey results, innovation through IT offers opportunities to improve patient care. Successful innovation in health IT calls for integrating structure, efficiency and scale both within and across care delivery settings,’” said Carla Smith, MA, CNM, FHIMSS, executive vice president, HIMSS. Smith noted that results from the 2013 Healthcare Provider Survey will be presented throughout education sessions at the National Healthcare Innovation Summit. Organized by HIMSS, hosted by AVIA and in alliance with NEHI, the Summit will be held May 13-15 at the Joseph B. Martin Conference Center at Harvard Medical School in Boston, Mass. Content at the Summit will focus on reducing costs and advancing the Triple Aim with the overall goal to transform healthcare. Read the complete report on the 2013 Healthcare Provider Innovation Survey, collaborative research from HIMSS and AVIA. Learn more about innovation at HIMSS14 during the Health IT Symposium on Feb. 23. Register for the National Healthcare Innovation Summit.